One year ago we opened a new Durham Branch facility on Angier Avenue to better serve the Bull City and surrounding counties. After we cut the ribbon, we immediately got to work and settled into our new distribution center. Just one year later we can already see what a difference has been made! Left: Outside of our previous location on Gilbert St. Right: Outside of our new location on Angier Ave. Since last April, we have made quite a few changes to the facility, most significantly the installation of two new coolers and a new freezer. In our previous building on Gilbert Street, we had minimal freezer space, limiting our ability to store critically needed meats and perishable items. 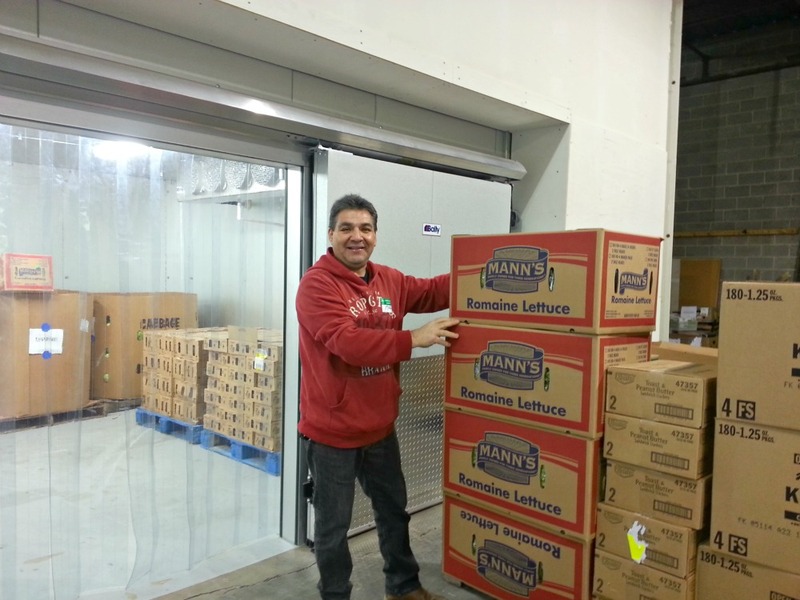 Now we have two freezers that are able to store up to 30 pallets of frozen goods–a huge improvement. Refrigerated space in our new facility – storing fresh produce, eggs, and other dairy items – has also increased by more than five times, allowing us to now store up to 50 pallets of refrigerated items. A volunteer from a partner agency retrieves lettuce from the cooler. Volunteer hours have doubled since the opening of the new building. We have also developed the volunteer project area and dramatically increased volunteer involvement at the branch. The volunteer space in the new facility is four times larger than the space in the previous facility. It is also temperature-controlled, allowing for flexibility throughout the seasons and making for a much-improved volunteer work environment. In the first month of operating in the new building, the number of volunteers and volunteer service hours more than doubled at the branch, and that trend has continued throughout our first year. Volunteers are critical to the Food Bank’s ability to sort, inventory, and distribute food efficiently, and we feel fortunate to be able to do so much more in our new Durham home. Bayer CropScience volunteers pack Weekend Power Packs in the new Dana Lange Volunteer Project Area. And of course, all of these improvements have ultimately allowed us to distribute more food. Already in the last year, we have been able to provide 822,000 more pounds of food than we could in our previous location. And this growth in food distribution is only expected to continue as we still have capacity to do even more in the new building. Volunteers from a partner agency pick up food at our Durham Branch. Why does this matter? Because Durham County has one of the highest rates of food insecurity among all of the counties we serve. 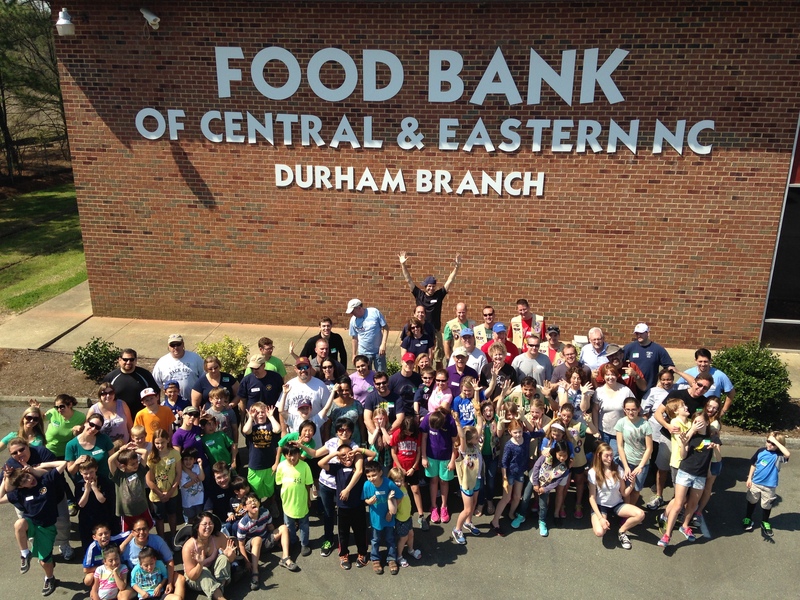 In the Durham Branch service area, more than 108,000 people live in food insecure households, including more than 31,000 children, and the need continues to rise. 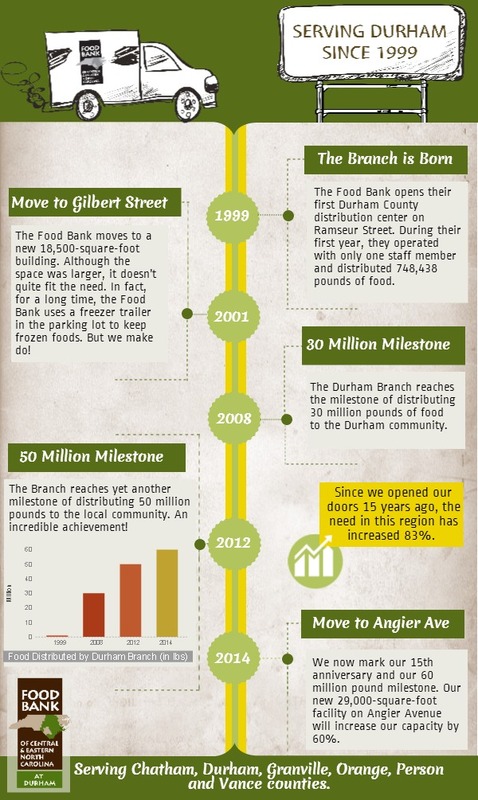 As the Food Bank and a leader in the Durham community, it is up to us to do everything we can to provide as much nutritious food as possible to food insecure households in the region, and with the help of our generous supporters, we will continue to work toward that goal. Volunteers are always excited to help out at our Durham Branch! 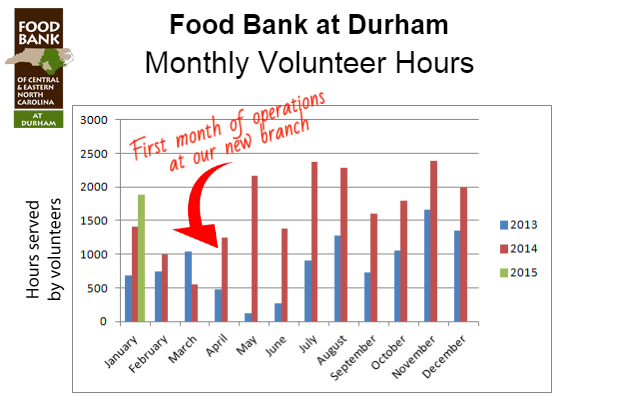 To learn more about what’s happening at our Durham Branch, please visit durham.foodbankcenc.org.